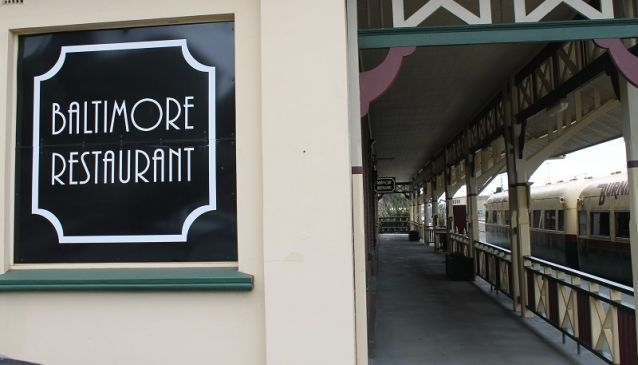 Just a short walk from the Burnie CBD and you are at Baltimore Restaurant, which is located in the heritage listed Old Burnie Railway Station on Marine Terrace. Two art-deco rail cars are permanently at the platform and in the past the dining carriage was used for group bookings. Baltimore Restaurant transports you back in time to enjoy fine cuisine in a unique dining venue. There are tables for any number of groups, from smaller booths for a romantic or private dinner to a larger area perfect for functions for up to 30 people. The menu showcases the local Tasmanian produce perfectly in a range of International dishes. The lunch menu offers a range of light snacks as a well as pizzas, pastas and risotto. The a la carte dinner menu houses a selection of entrees (seafood wontons and escargots) and hearty main dishes like Tasmanian fillet beef, lamb shank and escalopes of veal. There is a chance part of your meal may be sourced from the owner's garden with them using the freshest of ingredients. If you've got room, the dessert menu offers the old classics like soufflé, crumble or crème brulee. Your meal can be well accompanied by wine from the wine list in this fully licensed restaurant. With the husband and wife owners Richard and Peta-Anne Hall being fully hands on, the norm is to find Richard working as the chef in the kitchen and Peta-Anne taking care of front of house. Special dietary needs can be catered for on request and set menus are available for group bookings. Parking is available adjacent to Baltimore Restaurant in marked, reserved parking spaces. Disabled access is available.